Can you believe the year is half over? Time sure flies especially when you’re busy…and we definitely have been! We thank all of YOU for your support and making our work possible. A race organized by the Philippine Pediatric Society was held last April 6, 2014 at the SM Mall of Asia in Manila. 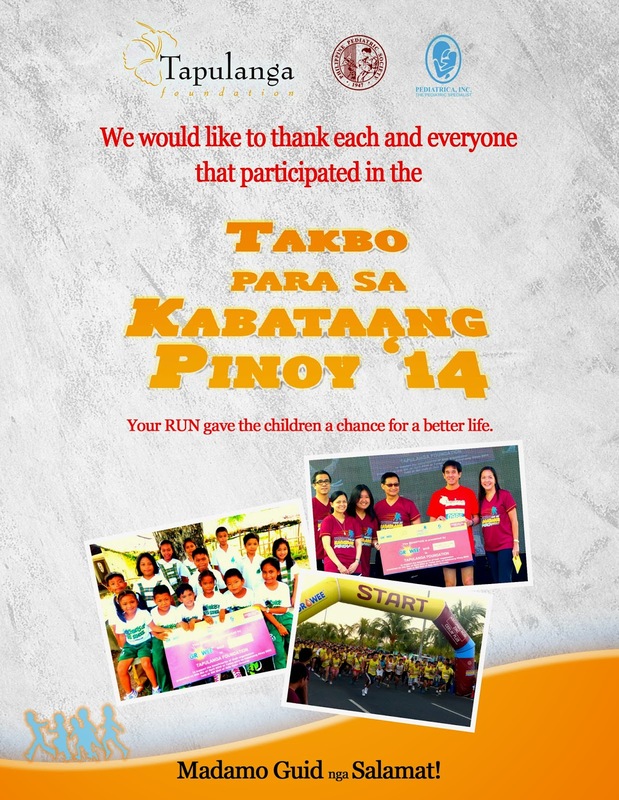 Entitled “Takbo para sa Kabataang Pinoy '14” (or “Run for the Youth”), the organizers had two beneficiaries and Tapulanga Foundation was lucky enough to be one of them. Executive Director MicMic Abello-Golez, former President Robin Abello, our new President Dr. Jo-an Ledesma-Millonado, and past and present Board Members Lizzie Ledesma, Vicky Ledesma-Tanchanco and Jay Abello joined in the fun with their family and friends. Funds received will be used towards the health care program of t he foundation. Thank you, Philippine Pediatric Society! Ever heard of that really popular game called “Cards Against Humanity”? Well, one of our longtime supporters, Dr. Alvin Sanico, came up with his own game and called it “Cards For Charity!” This clever card game allowed a player to form different words just by turning the letters upside down. The Cards For Charity Campaign offered donors a free set of game cards for donations as small as $5. The very successful campaign ran for six weeks and the beneficiaries were Boats for Busuanga and Tapulanga Foundation. The campaign raised enough funds to provide scholarships and books to 10 Pre-Kindergarten kids and 10 boats to the Typhoon Haiyan victims of Busuanga. Salamat, Alvin! The “75 Scholars in 30 Days Challenge” was definitely a challenge for us but we made it – and even exceeded our goal - because of your generosity. This fundraising campaign was done solely online and it was definitely a testament of how much people believe in the power of education. 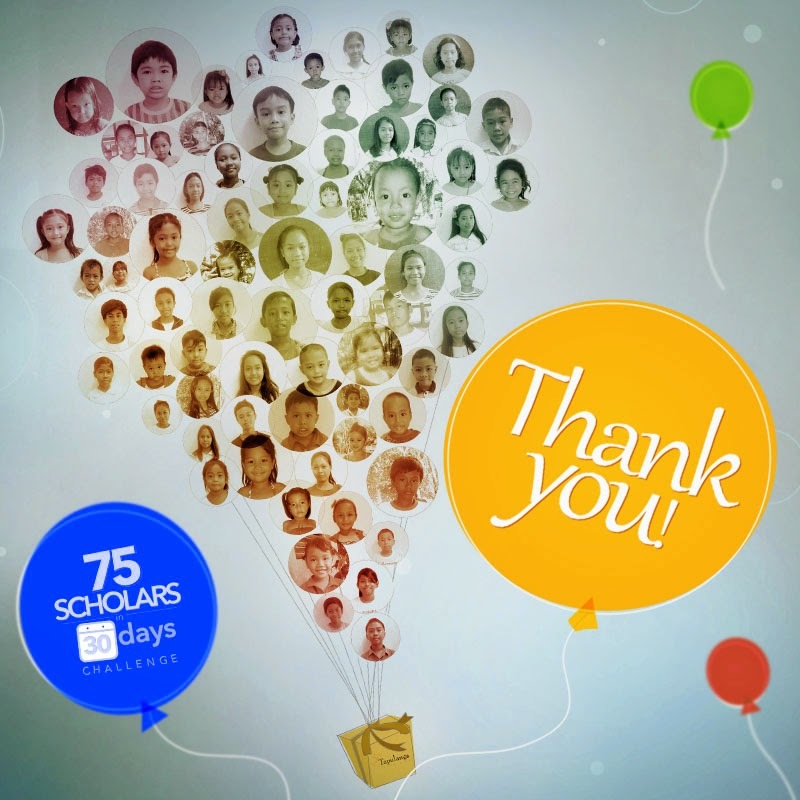 Because of YOU, we are blessed to welcome 100 new scholars to the school! From the bottom of our hearts, we thank you for your support and trust. There is more in store towards the latter half of the year as we strive with our commitment to give needy children a chance for a better life. Stay tuned…and, as always, MADAMO GID NGA SALAMAT!